Co-founder, Chairman, and CEO of Apple Inc.
↑ "The Walt Disney Company and Affiliated Companies – board of directors". The Walt Disney Company. Retrieved October 2, 2009. ↑ D'Onfro, Jillian (March 22, 2015). "Why execs from other companies wanted to meet with Steve Jobs on Fridays". Business Insider. Retrieved 2015-09-11. ↑ Isaacson, Walter (2011). Steve Jobs. Simon & Schuster. ↑ Foremski, Tom. 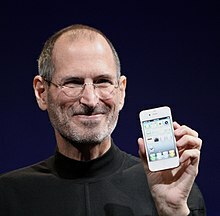 "The Steve Jobs way: Exploring the intersection of psychedelics and technology | ZDNet". ZDNet. Retrieved 2016-02-24. ↑ Smith, Alvy Ray. "Pixar Founding Documents". Alvy Ray Smith Homepage. Archived from the original on April 27, 2005. Retrieved January 11, 2011. ↑ Graff, Amy (18 November 2015). "Social media reminds us Steve Jobs was the son of a Syrian migrant". SFGate. Hearst Communications. Retrieved 19 May 2016. ↑ Staff (August 27, 2011). "Dad waits for Jobs to iPhone". New York Post. Retrieved June 27, 2015. "Steve Jobs: From Garage to World’s Most Valuable Company." Computer History Museum. 1995: Excerpts from an Oral History Interview with Steve Job, Founder, NeXT Computer – Smithsonian Institution, April 20, 1995.